Today I want to tell you about the United States’ Emergency Broadcast System (EBS), which was in operation between 1963 and 1997. It was designed to allow the President to speak to the people of America in the event of war, threat of war or national emergency. More specifically, I want to tell you about the false alarm that happened on February 20th 1971. The broadcast could be received by many radio and television stations across the country and the system was tested every Saturday at 9.33am Eastern Standard Time. A test message, that was generated from Cheyenne Mountain, Colorado, would arrive via a teletype printer. The message would be recorded in the transmitter log and everyone could just forget about it. In the case of a real emergency, a bell inside the printer would sound ten times, there would be a row of X’s at the start of the message and then there would be a codeword. The codeword changed every day and each station received a list of them every three months. They were to be kept sealed inside an envelope. As well as a codeword to authenticate the message, there was a second code word which could be used to cancel the message. THIS IS AN EMERGENCY ACTION NOTIFICATION (EAN) DIRECTED BY THE PRESIDENT. NORMAL BROADCASTING WILL CEASE IMMEDIATELY. ALL STATIONS WILL BROADCAST EAN MESSAGE ONE PRECEDED BY THE ATTENTION SIGNAL, PER FCC RULES. ONLY STATIONS HOLDING NDEA MAY STAY ON AIR IN ACCORD WITH THEIR STATE EBS PLAN. Anyone who ripped open their envelope and found the codewords would, at that point, have found that the authentication code for that day was indeed, ‘hatefulness’. Some stations went off the air immediately to make way for an announcement from the President. In Fort Wayne, Indiana, broadcaster Bob Seivers was forced try to explain to the listeners what was going on. He had no information to give them and just had to keep saying so over and over. Meanwhile at Mount Cheyenne, Wayland Eberhardt had realised his mistake and was frantically trying to cancel the message. He must have been in a terrible panic because it took him six attempts before he managed to include the correct cancellation codeword in the message. The word was ‘impish’. It took him forty minutes to cancel the message. I said only some stations went off the air. Only about 20% followed the correct procedure. Some didn’t know what the procedure was. Some didn’t even look at the message, assuming that it was just the regular test. Others realised other stations were still broadcasting and ignored it. Some stations did not receive the messages at all. One poor broadcaster tore open his envelope only to find that it was empty. The whole débâcle proved one thing beyond all doubt. EBS was rubbish. What good was it if not everyone had received it? Why was it that some people didn’t know what to do? What would happen if there was a real national emergency at 9.33 on a Saturday morning? How could they stop this horrible mistake happening again? I’m happy to tell you that poor, distraught Wayland did not lose his job. They looked at the way all the tapes were stored. They were all hanging on hooks side by side above the transmitter. They decided to remove the emergency tapes and put them away in a cupboard, leaving only the regular test tape near the machine. America’s emergency broadcast system is now all dealt with by computers, thus eliminating the possibility of human error. So it’s all fine now. Apart from that time in 2005 when the entire population of Connecticut was mistakenly ordered to evacuate. Or any of the other times it’s been set off accidentally. Or that time in 2013 that hackers broke into it to announce a zombie attack. Maybe you’re starting to think America’s Cold War plans to protect it’s people in the event of a nuclear attack were a bit rubbish. Want to know what was planned for us here in Britain? The BBC planned to distract us with music and light entertainment. There were hundreds of BBC staff and radio artistes who had been security vetted. In the event of all-out war, they were to be deployed secretly at transmission sites all across the country. I’ve found two hoaxes that happened on this day and, as I can’t choose between them, I’m going to have to tell you about both. You may have heard of Orson Welles’s famous broadcast of a play based on HG Wells’s ‘War of the Worlds’ and about the widespread panic it supposedly caused. I wrote about it back in October. Well, the BBC have a prior claim. It happened back in 1926, only four years after the BBC had begun to broadcast. The programme was listed in the Radio Times as “7;40: – The Rev. Father Ronald Knox – ‘Broadcasting the Barricades’, SB from Edinburgh.” What the Reverend Knox had written and broadcast was what he called ‘a burlesque’, by which he meant a parody, of a BBC broadcast. It was about a massive riot in London. He thought it was all far too over the top and silly for anyone to believe. But he was wrong. Listeners from all over the country would have been tuning in on a crystal set, like the one pictured above. They were tricky things to use and it would have been easy to miss the beginning of the programme, where it was clearly announced that it was “a work of humour and imagination, enlivened by realistic sound effects.” It began with what seemed like the end of the previous programme, an improving talk on Gray’s Elegy that everyone was probably hoping to have missed. Then there was a bit of static followed by what sounded like a live news report from Trafalgar Square. A demonstration by the unemployed had turned violent. People were sacking the National Gallery. This was not really so very long after the Russian Revolution in 1917, so it sounded like just the sort of thing people were afraid might happen here. There was an interlude featuring live music from the Savoy Hotel’s house band which was followed by a report that people were throwing bottles at the ducks in St James’s Park. Then, there was a rustling of papers as though more news was coming in and the announcer said: “One minute, please. From reports which have just come to hand, it appears that Sir Theophilus Gooch, who was on his way to this station, has been intercepted by the remnants of the crowd still collected in Trafalgar Square, and is being roasted alive… He is now being roasted alive by a crowd in Trafalgar Square.” This way of announcing the same thing twice was, at the time, characteristic of the BBC. Next came the news that the Minister for Transport, Mr Wotherspoon, had been captured and was being hanged from a lamp post on the Vauxhall Bridge Road. The announcer later apologised and corrected this statement; it had, in fact, been a tramway post. A bit more music was interrupted by the report that the demonstrators were advancing on Whitehall with trench mortars. After that, the listeners were told that the Houses of Parliament had been blown up and Big Ben destroyed. The announcer further explained that the building was built from magnesian limestone from Yorkshire, a material which is unfortunately liable to rapid decay. An unnecessary piece of information which was, again, typical BBC. Then, the music from the Savoy Hotel returned, but was interrupted by the sound of a large explosion. The announcer cut back in to say that the Savoy Hotel had also been blown up. Finally, He announces that the mob are advancing on the BBC. But luckily order was restored when everyone just sat down in the waiting room and started reading the Radio Times. People didn’t really know what had just happened. Knox thought he had put enough clues in the script to make people realize it was all a joke. The leader of his gang of rioters, Mr Popplebury, was constantly referred to as: “Secretary of the National Movement for Abolishing Theatre Queues”. An organisation which, if it existed at all, was unlikely to spearhead a revolution. But many people had just never come across satire, they didn’t understand it. A further problem was that they had no way of getting any sort of news until the papers arrived the following morning. This would be further exacerbated by a heavy snowfall the following day. It meant lots of people were unable to get their usual Sunday newspaper and that increased the worry that something might really be wrong. Many reached for they telephones. They called the BBC, they called newspaper offices, some even called the Admiralty and demanded that they send a battleship up the Thames to sort it all out. The Savoy Hotel had hundreds of calls. Some were worried about friends who were staying there, but others just wanted to know if they should cancel their reservations. At 9.00 pm the BBC had to broadcast an apology to the listeners who hadn’t realised it was all just a bit of silliness, and assure everyone that London was safe. By Monday, the newspapers were full of the story. They saw the BBC as a threat to their monopoly on the news and were delighted by the opportunity to show them as a dangerous and irresponsible organisation. John Reith, who was director of the BBC, was not annoyed at all. He was interested in raising the profile of the company and Knox’s broadcast had certainly done that. In fact, it wasn’t long before they were planning to make a similar programme for April Fool’s Day. My second hoax took place exactly 180 years earlier. Person or persons unknown advertised, in several newspapers, an event which was to take place at the Haymarket Theatre on January 16th 1746. There would be, on stage, a person who would do several unusual things. If any member of the audience were to come on stage, wearing a ‘masked habit’ he would be able to tell them who they were. Also, he would take a walking cane, that any of the spectators could provide, and play on it, the sound of any musical instrument. Most surprisingly of all, he would climb into a quart bottle (that’s two pints) and when he was inside he would sing a song. Whilst he was inside the bottle, anybody would be able to come and pick it up and look at it. They would see that it was just an ordinary bottle. The theatre was packed. Among the audience was the Duke of Cumberland, the brother of the king. It’s hard to know what people really expected to see, but at 7.00 pm, the lights went up and nothing happened. There was no music to entertain the crowd and they began to get restless. Eventually a hapless theatre employee had to go on stage and tell everyone that if the performer didn’t turn up soon, everyone would get their money back. One audience member shouted out that they would pay double if he would crawl into a pint bottle. Then things turned a bit nasty. A lighted candle was thrown on stage. The Duke left hurriedly. Those who remained behind gutted the theatre. Benches were ripped out, the scenery smashed and the boxes destroyed. They dragged all the debris out into the street and made a huge bonfire. At first, the theatre staff were under suspicion, but they claimed it had all been organised by ‘a stranger’ and it’s hard to imagine what they could possibly have gained from it. The likely explanation is that somebody did it for a bet. The Duke of Portland, the Earl of Chesterfield and the Duke of Montagu (who’s house I mentioned yesterday) were possible candidates. It was later claimed that the performer in question had been unable to attend because he had agreed beforehand to perform the trick privately to a gentleman for the sum of £5. When he was inside, the gentleman had corked up the bottle and taken him away. There was even an advertisement stating that people should go to the Haymarket Theatre on January 30th, where they would be able to see him climb out of the bottle. Today is the anniversary of the 1938 CBS radio broadcast of ‘The War of the Worlds’ which was directed and narrated by Orson Welles. It was one of a series of plays called ‘Mercury Theatre on the Air’, broadcast live between 8 and 9 pm Eastern Standard time on a Sunday night. History would have you believe that it caused nationwide panic and hysteria. This is not really true. 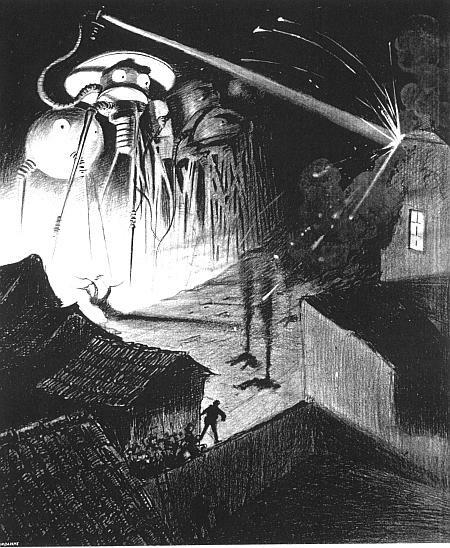 The play was an adaptation of the 1898 novel of the same name by H G Wells about a Martian invasion of Earth. The play used a modern setting and transferred the action from the south of England to New Jersey. The broadcast almost didn’t happen at all. Five days before it was due to air, its writer, Howard Koch, was finding it almost impossible to adapt the novel into a play. Together with his secretary and producer he managed to work out a script, but it was still quite boring. 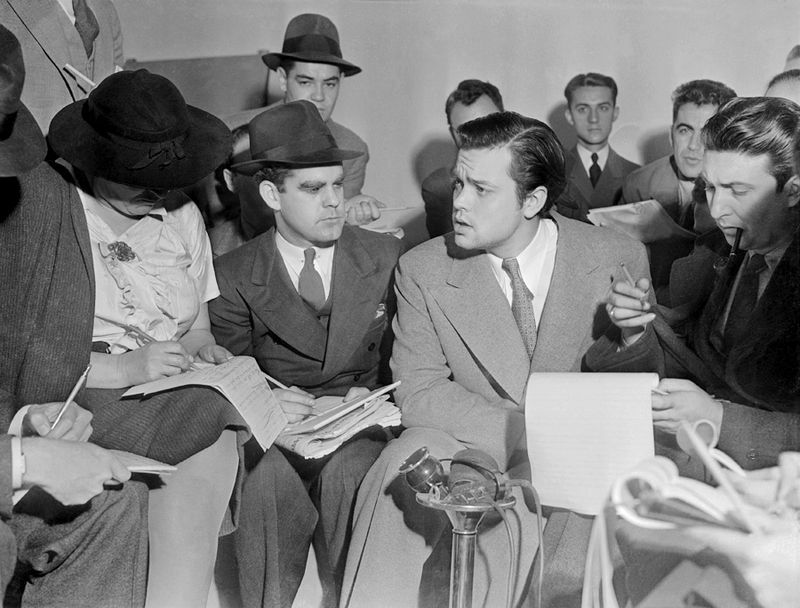 Welles heard a recording of the first draft two days later and thought it needed more urgency and excitement; eyewitness accounts and newsflashes. The script was reworked overnight and the names of real people and places were added. But CBS thought that made it too real and several had to be changed, which was probably just as well. The following day, Saturday, the play was rehearsed with a sound effects team and on Sunday the orchestra arrived and they were all set for their live broadcast of the play. The programme was listed in the Sunday newspapers as a drama and the New York Times had it among their leading events of the week as “Tonight – Play: H G Wells War of the Worlds.” It was also stated clearly at the beginning of the broadcast that it was a play. Yet popular myth makes us think that everyone who listened to it believed that they were really being invaded by Martians. The first two thirds of the drama are presented as new flashes interspersed with musical interludes. If you tuned in during this part, as some people clearly did, it would be easy to believe that you were listening to a news story unfolding in real time. Though if you were paying attention, you might notice that events escalate rather quickly. But radio was in its infancy and perhaps people weren’t wise to that sort of thing. Just over half an hour into the performance, the station supervisor received a telephone call asking him to interrupt the broadcast to make an announcement about its fictional content. With the planned break less than a minute away, he waited. The planned break announcement clearly stated that it was a play. By this time a few policemen had begun to arrive. Soon the room was full of policemen, and CBS employees struggled with them to prevent them from breaking into the studio and stopping the show. As the play ended, the producer’s phone began to ring. It was the mayor of a mid-western town who was furious because he said there was rioting in the streets. But he had to hang up on the angry mayor, because, at that moment, the police burst in. Everyone involved in the play was hustled straight into a back room and locked in. Meanwhile other network employees gathered up all scripts and records of the broadcast and either destroyed them or locked them away. Then, the press were let loose on the cast. They were faced with a barrage of questions. How many deaths did they think they had caused? Did they know about the riots? The traffic accidents? The suicides? Of course, they had been shut up in a studio and didn’t know anything. They were mortified. The station’s telephone switchboard was jammed with incoming calls and Welles thought his career was over. After the night rehearsal, Wells had only three hours sleep before he was called to a press conference. Reporters accused him of making his play too dramatic. While he was very sorry, and not a little surprised, to hear that his broadcast had caused so much upset, he does point out it is not the business of a melodrama to be more boring than real life. While there was some panic amongst listeners, particularly those who had tuned in part way through, the widespread hysteria was largely an invention of the press. Very few, if any, people believed America was being invaded by Martians, because people aren’t generally that stupid. In 1938 the world was an uncertain place, teetering on the brink of world war. Radio broadcasts were often interrupted by news from Europe. For the most part, the people contacting radio stations, newspaper and the police thought that the Germans were invading New York. If you missed the bit where they mentioned the Martians, this could be an easy mistake to make. Many newspapers assumed that all the phone calls and scattered reports of people fleeing their homes was evidence of a mass panic. In fact, this kind of reaction was not a common one. There was a problem in the town of Concrete, Washington, where the broadcast coincided with a power blackout. This meant that the phone lines were also down and they were unable to call friends to calm their fears, or hear the assurance that it was just fiction. So people were pretty upset there. Once the press heard about it, their experience was soon known all over America. The New York Times would have us believe that the streets of the city were heaving with people anxious to leave town. Yet a reporter from another newspaper remembers, as he sped in a taxi towards the CBS studio that evening, that the streets were almost deserted. Only a tiny amount of listeners had actually heard the broadcast, and if they had anything to complain about it they had mostly forgotten about it in a few days. Newspapers, on the other hand, went on and on for weeks about what a terrible and unreliable thing radio was. It’s interesting to learn that, in the late thirties, newspapers were losing a lot of advertising revenue to the new medium of radio. So they had a vested interest in discrediting it. Meanwhile, a short and hastily written play that was heard by almost no one, secured Welles’s fame as a dramatist.